The 5th of five singles, released every two weeks, up until the release of the 4th GBV reunion LP English Little League. Contains two exclusive b-sides. 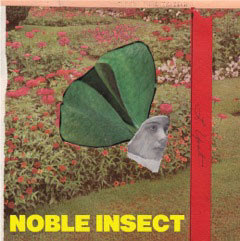 Noble Insect is reviewed as a part of the LP English Little League. Waves of Gray- 4 Tobin penned piano driven track. British sounding as all hell. Pensive heartstring tugging and all. Awesome. See You Soon- 3 Pollard's piano driven counterpart to Tobin's "Waves of Gray" almost manages to tug the heartstring a bit before it breaks off into vocal reverb madness and almost completely falls apart. One half charming, one half silly without the charisma.